If you use Docular on a desktop or laptop you'll see a new, streamlined sidebar in the instance editor. We've reduced clutter and that's allowed us to add a useful new feature. We've slimmed down the Save and Export buttons so they're on one line. You can still access the full range of download options via the [ ] button. We've created a feedback console where we keep you informed of changes that our software makes to your document as you work. For example, when you add or remove a provision, the software will automatically update numbering and cross-references. 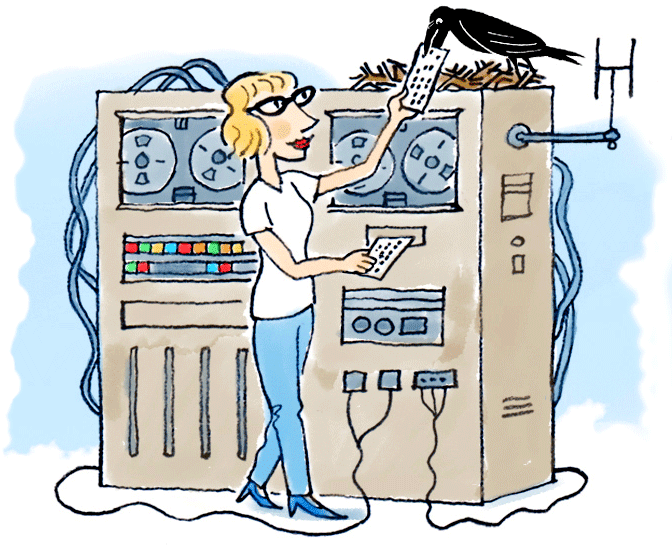 It will also tell you what's happening with instance saving and document downloading. 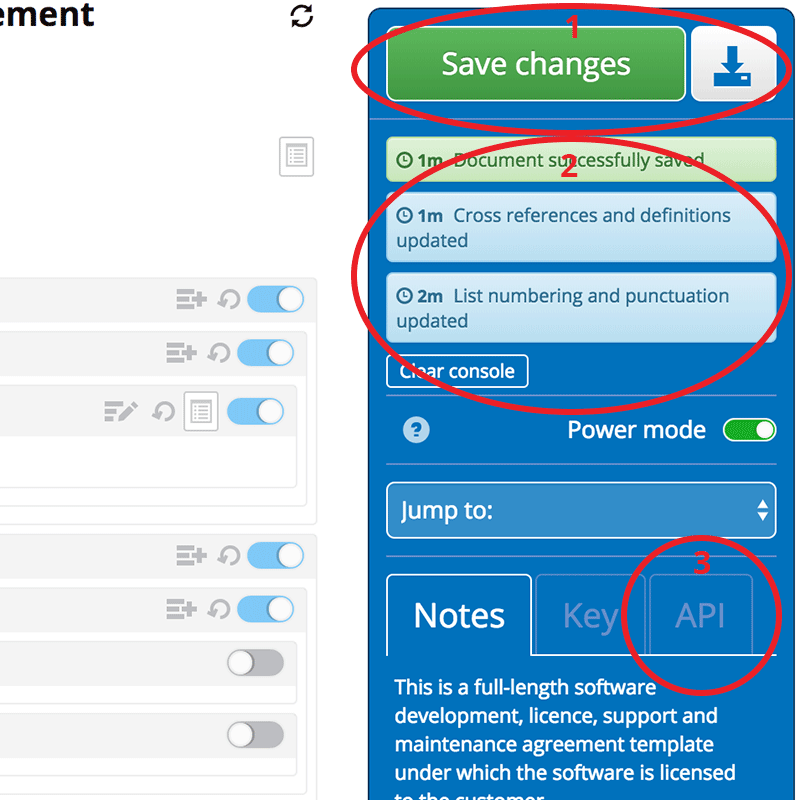 To reduce clutter we've moved the document API information to a new tab alongside the Notes and Key. Click on the tab to see the same features as before, just neater. Some Docular documents are long. Very long. Sometimes, finding the clause you need to edit is a long scroll. So, to make it easier, we've added a Jump to: menu on the blue panel on the right. Click the button and select the clause you want to jump to and it'll scroll quickly there. 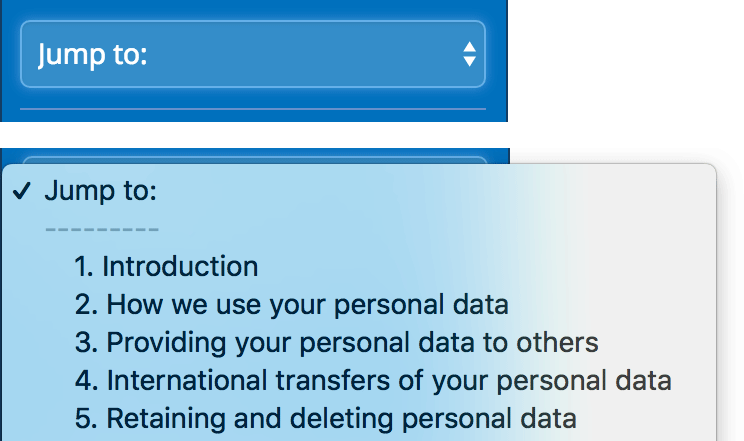 Docular now has an Application Programming Interface; a way for your web application to talk to Docular. With it you can pull your Docular documents directly in to your web application, ensuring your displayed documents are always up to date. Find out more about our API. The first thing we did with the API was build a Wordpress plugin. Wordpress is the most widely used website building tool, and our plugin will help you keep your terms and conditions and privacy policies up to date. Find out more about our Wordpress plugin. We've added a Revert button to the document editor. Now, you can go back to any point you saved the document. 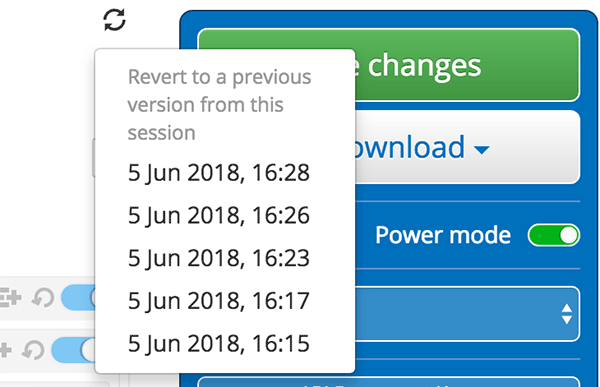 We only keep the revisions for your current logged in session, but if you've edited yourself in to a hole, there is a quick way to get back to where you were. The new power mode tools allow you to add custom provisions or freely edit existing ones. You might also want to add a new definition. The new custom definition tool allows you to write your own definitions. Just click the dictionary-like icon, and an edit box will appear. Your custom definition will automatically slot in to the correct place. You can easily edit your definition at any time. Docular does a great job at helping you draft your legal documents but sometimes you just need a little more freedom. So, we added Power mode. 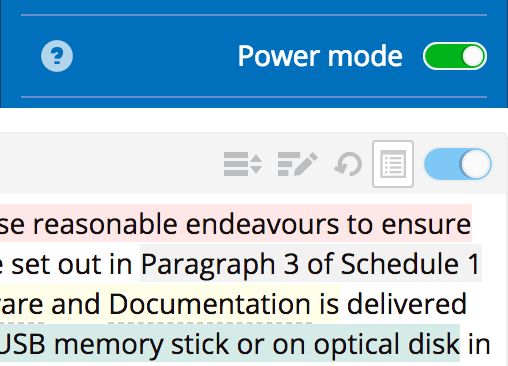 Power mode gives you a suite of advanced editing tools that allow you to customise your document to your needs. This provision is numbered. Click to make it unnumbered. Click again to make it numbered again.